Wide Asleep in America: Disregarding Law, Redefining Justice:The (Il)legality of Killing Osama, or "Bin There, Gun That"
The (Il)legality of Killing Osama, or "Bin There, Gun That"
"Actions are held to be good or bad, not on their own merits but according to who does them, and there is almost no kind of outrage -- torture, the use of hostages, forced labour, mass deportations, imprisonment without trial, forgery, assassination, the bombing of civilians -- which does not change its moral colour when it is committed by 'our' side...The nationalist not only does not disapprove of atrocities committed by his own side, but he has a remarkable capacity for not even hearing about them." Much has already been written about the legality of the SEAL Team Six operation in Abbottabad, Pakistan. While there is little discussion or interest on the so-called "right" regarding such trivialities as international law and extrajudicial killing, some on the so-called "left" have seen the value of raising questions and attempting to answer them. While some suggest (or declare) that, based on the information available from the White House public relations team, Osama bin Laden was assassinated without requisite due process, others - like ThinkProgress' Matt Yglesias and American Prospect's Adam Serwer - have laid out evidence insisting that the raid and killing of bin Laden was perfectly legal. Soon after MSNBC's resident blowhard Ed Shultz dismissively mocked "intellectual liberal hand-wringing" over the kill team's legality and appropriateness, Serwer posted a summary of his pro-legality arguments under the heading, "A Liberal's Guide To Why Killing Bin Laden Was Legal," in which he tries to "collect all the liberal arguments against the legality of killing Osama bin Laden in one place" and then address them one by one in a good faith effort "to make clear why killing bin Laden was legally justified." Unfortunately, Serwer - who is an impressively prolific and astute analyst - doesn't do a very good job. His selective reading and application of international law and United Nations resolutions, as well as his inability to decide whether or not al Qaeda is a "criminal organization" or a "military target," does his smug declarations no favors. This is not to say that the determination of legality in this regard is an easy or uncontroversial one, but that Serwer's analysis is, at best, weak and unconvincing. Earlier this year, Serwer wrote of his frustration with the Obama administration's continuance of the Bush "war on terror" policies (though, amazingly, he praised the Bush administration for constructing a narrative based on flat-out lies). He condemned the Bush policies of "torture, rendition, the use of black sites, a two-tier system of justice for suspected terrorists, and the prison at Guantánamo Bay" and lamented that "Obama has preserved the 'hybrid' legal system for suspected terrorists and has announced he will continue to hold 50 Guantánamo Bay detainees indefinitely" and described the policy as "lawless." The system he decries is one based on a false premise, pushed by the Bush administration, that the "war on terror" is a legitimate military operation - a real "war" - in which captured combatants and suspects are treated as prisoners of war (and therefore can be detained without prosecution until the "cessation of hostilities" - which translates into permanent incarceration without due process since any manufactured "war" against a tactic or ideology is inherently endless). So, according to Serwer, the capture and torture of suspected terrorist Khalid Sheikh Mohammed, who the 9/11 Commission called "the principal architect of the 9/11 attacks," is "lawless," while the extra-judicial execution of Osama bin Laden, who has never stood trial for his crimes, is "legally justified." Oddly enough, in reference to the water-boarding of KSM and information obtained through torture, Serwer recently wrote in the Washington Post, "Effectiveness aside, torture wouldn't be morally justified even if it worked." So, again, torturing the 9/11 "mastermind" is unethical, whereas putting two bullets in the head of Osama bin Laden (read: not the 9/11 mastermind) and dumping his body in the ocean is, in Serwer's own words, "the most proportionate, legally and morally justified use of American state force against terrorism in a decade." This hardly makes sense, unless you assume Osama bin Laden represents a singular, inhuman evil or believe his killing is required as a symbolic action of American triumph and commitment. If so, it follows that neither domestic nor international law has any meaning and that political assassination is legitimate so long as it might provide "closure" for someone, somewhere. American exceptionalism laid bare. In his defense of the legality of the bin Laden killing, Serwer treats this "lawless" system as a forgone conclusion - one that exists wholly within the letter of the law. If, as Serwer argues (quoting former government attorney W. Hayes Parks), the shooting of Osama falls under the category of "the killing of enemy military personnel in time of armed conflict," then Serwer is embracing the definition of al Qaeda as a militarized army with bin Laden as its commander-in chief. Serwer primarily credits this new distinction (as opposed to the pre-9/11 calculus of terrorism as a criminal act to be investigated, its perpetrators apprehended, prosecuted, and sentenced) to "the result of Congress passing the Authorization to Use Military Force [AUMF] in 2001." "That the President is authorized to use all necessary and appropriate force against those nations, organizations, or persons he determines planned, authorized, committed, or aided the terrorist attacks that occurred on September 11, 2001, or harbored such organizations or persons, in order to prevent any future acts of international terrorism against the United States by such nations, organizations or persons." This is not a declaration of war; it is license for the president of the United States to act as sole arbiter of responsibility, guilt, conviction, and sentencing with regards to the perpetrators of the 9/11 attacks. Such authority is not only wholly unconstitutional, it is also illegal with regard to even a cursory understanding of international law. The AUMF makes no distinction between alleged terrorists and the states in which they operate or organize. "In essence, an armed attack on another country's territory must be either an act of self-defense (safeguarded by Article 51 of the U.N. Charter) or somehow authorized by the U.N. Security Council. While the Security Council has recognized the right of countries to defend themselves against terrorists, it has never given blanket authorization for countries to conduct cross-border operations without the consent of the governments involved." "War" is a word, not a policy, but it's a word with specific legal and policy implications. It's one thing to say that counterterrorism considerations led the United States to get involved in a war in Afghanistan, but another thing to say that the war in Afghanistan is actually one "front" in a larger "war on terror." Yet now that Barack Obama is being hailed as a hero who presided over the killing of America's arch-nemesis Osama bin Laden, Yglesias ignores his own previous principles. Now, it seems, it is fair game for U.S. commandos to enter Pakistan to hunt for bin Laden, since, hey, it's a war with multiple fronts and no defined borders and the AUMF authorizes Obama to utilize those very "war powers." 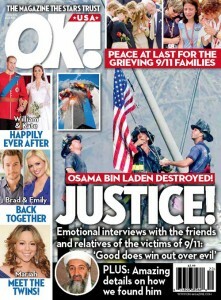 "In the best case, the killing of bin Laden exists in legal limbo. If the raid was definitively Title 10 [a military operation], it violated a slew of restrictions on the use of military force in a country that is not a formal enemy of the United States — this despite the Congressional authorization for using force against Al Qaeda. If it was Title 50 [a CIA-dominated covert action], it could possibly be characterized as a political assassination, which is illegal under a 1976 Executive Order." Again referring to the AUMF, Serwer asserts that "the Congress of the United States authorized the use of military force against bin Laden in full view of the public in 2001." Serwer, who writes a great deal about human and civil rights, as well as criminal justice, disregards any sort of legal due process (one of the most important tenets of the Magna Carta, and subsequently U.S., humanitarian and international law) when it comes to assessing responsibility for the crimes committed on September 11, 2001. Due process doesn't simply exist only for those people who aren't considered "the world's most wanted man" or the mastermind or spiritual leader behind the most horrific acts committed on American soil - it exists for everyone. That's the whole point. Shortly after 10:00am on the morning of September 11, 2001 (mere minutes after the South Tower of the World Trade Center had collapsed at approximately 9:59am), Katie Couric, broadcasting live on NBC reported that the Democratic Front for the Liberation of Palestine had claimed responsibility. She asked correspondent Andrea Mitchell, who was on the phone from Washington D.C., whether the State Department was taking the claim seriously. "Are they giving any credence to that or are they dismissing that?," she inquired. "How do they feel about who might have been responsible for this?" "The bombings went off in Tanzania and in Kenya almost simultaneously. It was extraordinarily well coordinated. They proved their case to a jury effectively and have managed to develop a great deal of information from sources, from in fact turning some members of his network. So they believe he is the most likely person, but it's far too early to say anything." "This is war. This is a declaration and an execution of an attack on the United States. Two of our most conspicuous symbols of the American system of capitalism; the Pentagon, which is of course the headquarters of the most mighty military in the world, was attacked today as well." Still, the AUMF, which was passed a mere week after the attacks, in a period of intense confusion, shock, anger, mourning, and national trauma, does not identify anyone in particular with having carried out the attacks, yet authorizes the president to wage a military campaign on whomever he deems worthy of American vengeance. Serwer overlooks this and simply assumes it refers to bin Laden since that's what the official narrative claims. Often overlooked is the fact that, almost immediately after the attacks, bin Laden himself denied responsibility. "The U.S. government has consistently blamed me for being behind every occasion its enemies attack it," said a statement from the al Qaeda leader broadcast by Al Jazeera on Sunday, September 16, 2001. "I would like to assure the world that I did not plan the recent attacks, which seems to have been planned by people for personal reasons," it continued. Both bin laden and the Taliban claimed he had no ability to coordinate such an attack. When asked about the denial, George W. Bush insisted, "No question he is the prime suspect. No question about that." Soon after the attacks, the Taliban leadership offered repeatedly "to hand Bin Laden over to a neutral Islamic country for trial, if there is proof of his crimes." In response, George W. Bush replied, "We know he's guilty. Turn him over." On October 1, 2001, just six days before the bombing of Afghanistan began, the Taliban repeated their offer. George Monbiot, reporting for The Guardian, reveals that the Taliban's "representative in Pakistan told reporters: 'We are ready for negotiations. It is up to the other side to agree or not. Only negotiation will solve our problems.' Bush was asked about this offer at a press conference the following day. He replied: 'There's no negotiations. There's no calendar. We'll act on our time.'" The U.S. government declining to provide any evidence of bin Laden's guilt, stated that the Taliban offer was "inadequate" and instead "dispatched war planes and ships towards Afghanistan." 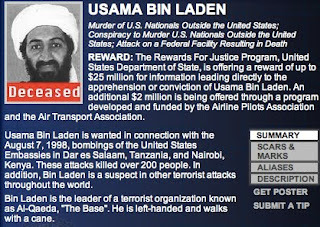 On October 4, 2001, a British intelligence report, entitled "Responsibility for the terrorist atrocities in the United States," claiming to provide evidence that "Osama Bin Laden and al-Qaeda, the terrorist network which he heads, planned and carried out the atrocities on 11 September 2001," was released with the following disclaimer: "This document does not purport to provide a prosecutable case against Osama Bin Laden in a court of law." The following day, a BBC report, entitled "The investigation and the evidence," concluded, "There is no direct evidence in the public domain linking Osama Bin Laden to the 11 September attacks...At best the evidence is circumstantial." "These attacks were not just an act of terror. They were an act of war. The most pressing issue for the FBI and for the nation was to find out who we were at war with, and more importantly, to make sure we were not attacked again. "The hijackers also left no paper trail. In our investigation, we have not uncovered a single piece of paper – either here in the U.S. or in the treasure trove of information that has turned up in Afghanistan and elsewhere – that mentioned any aspect of the September 11th plot." Mueller also said of the ongoing FBI investigation into the attacks, "The investigation was enormously helpful in figuring out who and what to look for as we worked to prevent attacks. It allowed us to see where we as a nation needed to close gaps in our security. And it gave us clear and definitive proof that al Qaeda was behind the strikes." In an article entitled, "Mueller Outlines Origin, Funding of Sept. 11 Plot" and published in the Washington Post on June 6, 2002, veteran journalist Walter Pincus reported that Mueller's FBI "investigators believe the idea of the Sept. 11 attacks on the World Trade Center and Pentagon came from al Qaeda leaders in Afghanistan, the actual plotting was done in Germany, and the financing came through the United Arab Emirates from sources in Afghanistan" and quotes Mueller saying, "We think the masterminds of it were in Afghanistan, high in the al Qaeda leadership." Additionally, he stood accused of murder and conspiracy to commit murder of "U.S. Nationals Outside the United States," with no mention of the murders he is said to have been responsible for in New York and Washington D.C.
By contrast, as Andrea Mitchell had noted on the morning of September 11, 2001, the U.S. government successfully indicted bin Laden via Grand Jury in New York on November 6, 1998, for the embassy bombings in Africa. No such indictment has ever been forthcoming with regard to the 9/11 attacks. It should also be noted that, earlier this month, the FBI replaced Osama bin Laden's Most Wanted profile with that of his apparent al Qaeda successor Ayman al-Zawahiri, yet still neglects to mention anything having to do with 9/11 on his rap sheet, which looks nearly identical to bin Laden's. With regard to the Taliban's responsibility for the attacks (as demanded by the AUMF), the United States' own 9/11 Commission Report concluded that, "we have seen no evidence that any foreign government – or foreign government official – supplied any funding." Do these reports absolve bin Laden of responsibility or prove his innocence? No, of course not. But that's what trials are supposed to be for. One does not have to believe that Osama bin Laden is a good person or that he didn't deserve life imprisonment or even the death penalty (if one supports capital punishment) for his crimes to believe that revenge is not justice. Nevertheless, the questions which inevitably arise from such suggestions are dismissed outright by progressives like Serwer, who equates any questioning of the official 9/11 narrative with ludicrous conspiracy theories worthy of the Elders of Zion. Apparently, for Serwer, any skepticism about the official story is tantamount to wholly endorsing the conclusion that 9/11 Was An Inside Job™ and therefore deserving of derision. This is both disingenuous and embarrassing for such a rational and well-informed analyst. With regard to the legality of bin Laden's killing under international law, Serwer quotes Daphne Eviatar of Human Rights First, "As the leader of al Qaeda --an armed group against whom the U.S. is at war -- who appears to have had a significant role directing its fighting forces, [Osama bin Laden] is targetable. It's similar to the targetability of the commander-in-chief of any regular armed forces at war." Eviatar later elaborates, stating that "two states at war could target each other's heads of state IF the head of state is the Commander-in-Chief, or otherwise in the military chain of command. If he's only a civilian, then not unless he picks up a gun and starts shooting, in which case he'd be directly participating in hostilities." Leaving aside the question of whether the so-called "War on Terror" or the Orwellian moniker "Overseas Contingency Operation" can actually be classified as a "war" (since the combatants and geographical limitations are completely undefined and determined solely by the President of the United States), Serwer claims that, although the U.S. had legal authority to kill Osama bin Laden (as the leader of al Qaeda), members of al Qaeda do not have a similar authority to target Commander-in-Chief Barack Obama because al Qaeda "is a criminal organization," and not a national military. Wait, didn't Serwer just argue that al Qaeda was a military organization against which the U.S. is waging a "war"? Is Serwer arguing that al Qaeda, as a non-state actor, does not enjoy the same rights as the U.S. to target the leader of the military force against which it is fighting? Additional Protocol II to the Geneva Conventions, adopted on June 8, 1977, relates specifically to "cases of armed conflict not of an international character," that is, not between two states at war. Article 6, which "applies to the prosecution and punishment of criminal offences related to the armed conflict," holds that "No sentence shall be passed and no penalty shall be executed on a person found guilty of an offence except pursuant to a conviction pronounced by a court offering the essential guarantees of independence and impartiality" and maintains that "no one shall be convicted of an offence except on the basis of individual penal responsibility." "[e]xpresses its readiness to take all necessary steps to respond to the terrorist attacks of 11 September 2001, and to combat all forms of terrorism, in accordance with its responsibilities under the Charter of the United Nations;"
"[c]alls on all States to work together urgently to bring to justice the perpetrators, organizers and sponsors of these terrorist attacks and stresses that those responsible for aiding, supporting or harbouring the perpetrators, organizers and sponsors of these acts will be held accountable;"
A subsequent UNSC resolution, passed on September 28, 2001, calls upon States to "[e]nsure that any person who participates in the financing, planning, preparation or perpetration of terrorist acts or in supporting terrorist acts is brought to justice and ensure that, in addition to any other measures against them, such terrorist acts are established as serious criminal offences in domestic laws and regulations and that the punishment duly reflects the seriousness of such terrorist acts." Justice and accountability, not revenge and execution. These resolutions, which are legally binding, clearly hold terrorist actions to be criminal offenses, not military aggression, regardless of what George W. Bush proclaimed on September 20, 2001 or what Barack Obama said on January 7, 2010. Serwer leaves this piece out of his analysis even though he describes himself "as someone who believes terrorism is a crime crime not a war crime." "We're the most powerful nation in the world and national security officials and terrorist experts have been saying for some time, a small band of very willful and sophisticated people can bring us to a halt and they have done just that. There's a psychological terror as a result of all this as you can only imagine how it plays out across the country today. People looking in, who don't live in New York or don't live in the nation's capital are wondering 'what happens around me?' It is hard to overstate the consequences of all of this and this is just the beginning. We'll be living with this story and dealing with the consequences of it for some time. The United States will change as a result of all of this...This is going to change this country profoundly in not just the coming days, but the coming months..."
How right - how tragically right - he was. Members of the bin Laden family vacation in Sweden in 1971. 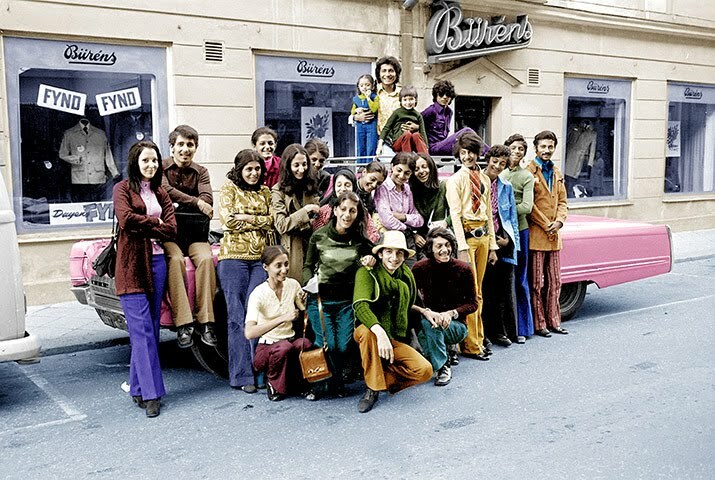 Some claim Osama bin Laden is pictured second from the right, but The New York Times disputes this.